No theme this week: just an eclectic mix of some of my favorite submissions that have come in over the past few months. By Amanda R. of The Sweet Treat Leap Cake Shoppe, which I dare you to say three times fast. I'm digging the cartoony shape of the skyscraper, and just look at those handcrafted figures! I want them all. Can you just make me a batch of gumpaste superheroes, Amanda? You know, for my desk? I'm not greedy; I'll just take Batman & Robin & Green Lantern & the little Superboy up there. And Spidey. And a few bags of cartoon money. And a balloon or two. But that's it. Gosh, going by my choices so far you'd think I was a thirteen-year-old girl, and not a...um...slightly older girl. And show you some cutesy cartoon candy, instead! Look at those ice cream cone pillars. LOOK AT THEM. And the candy dots border! And the pleated rainbow ribbons! And the lollipops! Can you get a sugar high from eye candy? Because I think I just did. I'm a big fan of cake artists who use icing like paint, both because it's a rare skill and because it gives the cake a charmingly handcrafted look. This cake is entirely fondant-free, and all the dogs are hand-piped. As if that weren't enough, check out the thin black lines; don't they make it look like a 2D drawing popped off the page? It's cakes like this that give me the baking itch all over again. Love it. You guys know I've seen a lot of great cakes, so when I tell you this next one made me gasp with delight, you better believe it's something special. I'm in awe of this cake's construction. It's not easy to make a cake look like it's falling apart without it *actually* falling apart! I'd love to see the interior supports & in-process photos - talk about an engineering feat! Hmm. I think this post could use a little more green, don't you? "Find me delicious, you will." Ruffles and flowers and bows, oh my!! Not only is that some killer cute detailing, I'm also loving the color choices. Apple green, sky blue, fuchsia, and gold make a surprisingly beautiful combination! This beauty has a real Tim Burton vibe to it, and that winged wrench topper looks so much like a bat that it took me a few seconds to realize what it was! And look at the tiny screwheads or rivets on the bottom lantern tier! Plus that airbrushed glow is easily my favorite part of the whole cake; it's so vivid, and the scrollwork and spider really "pop" against it. Just beautiful. Hope you enjoyed meandering through my favorite Sweets this week, guys! 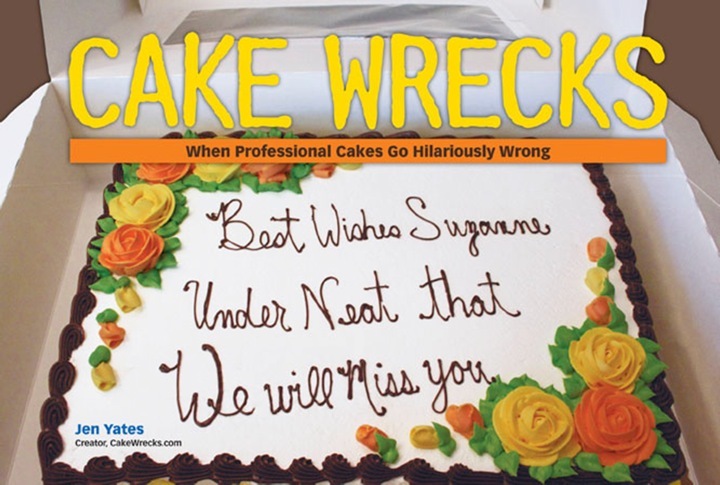 Next Sunday I think I'll do an Avengers post, so if you bakers out there have a cake you'd like us to consider featuring, please send it to Sunday Sweets [at] Cake Wrecks [dot] com! So very pretty!! My 8 y.o. loves the candy cake and I think Tink rocks! Thanks for having this site Jen and John (THoJ). Much love goes into it, and we get much love from it. June 3, 2012 | Rachel T.
I LOVE the side rainbow of awesomeness!! And the candy one? Beautiful! Can I have it for my next birthday? It wouldn't be weird for a thirty something year old to have that right? With cakes this gorgeous, who needs a theme? The cartoon candy one is my fave, I think. Like you, I'm in awe of the leaning cake because, dang, keeping that from going over would not be an easy feat. Oh, and save one of Yoda's ears for me. Someone else will have to cut into that cake first, though--on second thought, someone would have to cut into all of these cakes first, because I'd find it too hard to ruin such artistry. Are they really made of cake? Like can they be eaten? Were they eaten at some point? I'd love to see a 'slice cut out, an on a plate' edition of Sunday Sweets, someday. "Look Mother, it's my life...okay? So if I want to live on a beach and walk around naked...oh..."
I'm surprised, Jen, that you aren't planning a renewal of vows ceremony right now with John (thoJ) just so that you can have that steampunk cake at the reception. And thank goodness for that Tinkerbell cake after all of those wrecks the other week. I didn't even notice the flower silhouettes until you pointed them out. It's the tiniest details that make some of these Sweets so awesome. Those flowers. That lady-bug. Love the Tinkerbell cake! And after seeing the Janice cake, I want the entire Electric Mayhem cakeified! The sad thing is, most of these cakes are for younger kids and they'll never appreciate them for what they are: pieces of art. To them, it's just cake. These are incredible! We spend so much time during the week laughing at the Wrecks that it is easy to forget that there are real artists out there, who take the craft seriously and produce such absolutely stunning work. Thanks, Jen, for sharing the Sunday Sweets, giving us a moment of awe, and reminding us that yes, it can be and is being done right. I'll be turning 40 this year, but if I had the skills, I would be making that candy cake for myself. I love it! I wouldn't want to share it though- it's just too pretty! @ Sharyn, the boyfriend loved your comment about the Yoda cake. Suddenly I have the urge to listen to Weird Al. I loved this post too much! I cannot believe the texture on the Janice cake, and the Sleeping Beauty one made me insanely happy, like almost teary-eyed at how sweet the idea was and the flawless execution. Brilliant. I only have one complaint about the Superhero cake: Spiderman is from the Marvel Comics universe, the others are DC. That is all. Who wants to grow up when these fun cakes are there for kids? At 72, I'm still enjoying "kid stuff". On a separate note, when I saw the cake marked Sleeping Beauty, I was thinking it was Cinderella themed instead. The broom was my tip-off. Thanks for this site. It is the highlight of my day. The candy one was origionally done for the 2012 Wilton yearbook. Instructions are there ;).. I really love the baby shower cake near the bottom.. super cute!! I hope one day a cake of mine will end up on Sunday Sweets!! Jen, I love your site but I'm sooooooo disappointed--you never show anything buttercreme! Yes, I'm an icing elitist! Fondant is Play-Doh! That Tinkerbell is awesome too. @ Amy.... uh, I hate to be a nit-picker, but the sixth cake is "entirely fondant-free." Jen is showing the love for buttercream, too! Also @Emily, thanks for the info! I'll have to find a copy of the yearbook and see how well I do. It is the little details that make the difference, the little pom, poms on Tink` shoes are adorable! i vote for sweet wreck. BTW it's my birthday today & while i have a very pretty cake today, i'd love to have something like that cartoon candy cake. CP is haveing a avengers party next week, so that will be a PERFICT time to do that SS post. I was so pleased to see the Sleeping Beauty cake! (& how on earth does it not fall over?!) That scene was what inspired me to do a "CAKE OR DEATH" mashup with Sleeping Beauty! I was in the archives the other night. Along with discovering the surname of someone I'm trying to friend on Facebook, I ran across a mention of a couple of commercial fondant upgrades that are said to taste much better than the original variety. I wonder if there is a particular reason why these other fondants are not used more often. That top cake am, is, are and be my new all-time favorite Muppet cake. Sorry, Yoda. I caught the Sleeping Beauty reference before I even saw the bottom of the image. Delightful! "come on bucket, mop, broom...Flora says clean up the room!" I'm sure if I were to cut into that cake, I would need magic to clean it up!!! I personally like the Yoda one the best but then I am A Star Wars fan. Isn't obvious how the Sleeping Beauty cake is staying up? Fauna said it herself, "Of course it will be much stiffer after it's baked." This picture must be taken after baking. The one with the animals in party hats reminds me of my favorite book growing up. It was called "Cheltanham's Party." I'm sure this cake isn't based on that book (because NO ONE I know remembers it!) but it was still a great reminder of a story I hadn't thought about in years. Love the Star Wars cake, I do...! That Yoda cake! Have it, I must! @Ela, It's all good. Thanks. @Cyberjar88 that was my first thought too. Call it the comic nerd in me, but Spiderman doesn't belong with the DC heroes! June 5, 2012 | Kim T.
#6: Is this actually a "cupcake cake" that Jen likes?!?! lol. These cakes are amazing. I wish I could have the Sleeping Beauty birthday cake. It's bittersweet for me see the Sunday Sweets page. While I love seeing the amazing talent these cake decorators poses, it often makes me wonder why I even bother making cakes myself. I'll never be at that skill level. June 14, 2012 | Stacey M.